Micro.blog: A couple of days ago I posted this: "I really do think this is a great service, and I’d like to be here regularly, but I wonder how much longer I’ll do this if no one I know (or almost no one I know) is here. I’m keeping fingers crossed that friends will show up!” And immediately I started getting a flood — well, honestly, it was just a trickle, but given how small the place is overall it felt like a flood — of dudes advising me how find new people, how to get more followers, and I thought: Ah. Here we go again. I’m a pretty intense introvert: I don’t want to meet new people, in an ideal world I would have no followers I don’t already know and like, and nothing will ever convince me that giving unsolicited advice to strangers isn’t extremely rude. (Acknowledgment: I know those guys were “just trying to help.” I get that. Nevertheless.) It’s the old problem of intimacy gradients all over again, but on a platform that actually has fewer controls on what you’re open to than Twitter does. In theory I’m totally supportive of the simplicity of micro.blog, but … what all this demonstrates to me is that with social media I have two choices: far more unsolicited human interaction than I’m comfortable with, or no social media at all. So I just need to make my call and live with the consequences. Notebooks: For several years now I’ve been using the Leuchtturm1917 A5 notebooks, which are just marvelous. But they are fairly narrowly ruled, and I find that writing a little smaller than comes naturally to me tends to make my hand cramp. So when I finished my last Leuchtturm I decided to try the slight-more-widely-ruled Conceptum in the same size, and it’s great. The thicker paper is also very nice to write on. For around the same price it has fewer pages, and of course I’ll write fewer words per page, so I’ll go through this more quickly than I would a Leuchtturm, but that’s a relatively small price to pay for more comfort. Plus, it’s sort of fun coming to the end of a notebook and putting it on the shelf with its predecessors. Pens: I have a few fountain pens (nothing fancy, mostly Pilots) that I like, but it seems that when I write my grip slides down the barrel of the pen in such a way that I always end up with ink on my fingers. I don’t mind being metaphorically an ink-stained wretch, but I’d rather not make that literal. I tried a Tombow rollerball but I find it a scratchy experience. I don’t like using throwaway pens but I have found that the smoothest, most enjoyable writing experience I can get for a reasonable price and no inky fingers is the Pentel Energel. Highly recommended. So old men may complain about the condition of their times simply because they’re old men and (therefore?) grumpy; but they may also complain because things really have changed and they’ve seen it. And the people who live on both sides of a cultural or political (or even meteorological) divide may be very useful observers of their scene. Jacques Ellul is another such figure, who lived through a massive transformation in French society; and I might also cite Lesslie Newbigin, who left England as a young man to serve as a pastor in South India and returned forty years later to find a very different culture, which he sought to address theologically and pastorally in a brilliant book called The Gospel in a Pluralist Society. People who have experienced massive social changes and do not merely react against them, but rather strive to comprehend them analytically, tend to be very valuable thinkers indeed. And their habits of critique can be enormously helpful to those of us who are living through our own period of change. That is why when I try to understand our current technopolic moment I find that the thinkers who help me the most are not the ones fully immersed in our own time, but those who remember an earlier time, or those from the past who underwent similar social transformations. It is very hard from within this technologically oversaturated moment of ours to discern its outlines clearly. I’m therefore drawn to thinkers whose vocabularies are tilted or skewed in relation what I see and hear every day. This is one of the many uses of reading old books. More details about Ruskin soonish. Thirteen years ago, when my friend Jamie Smith launched his blog, he named it Fors Clavigera in honor of a strange and powerful project by the great Victorian sage John Ruskin. Jamie rightly notes in that first post that the original Fors Clavigera, though published as a series of monthly pamphlets, could be seen as a kind of “proto-blog.” How so? Let’s start with some background. Ruskin thought of these pamphlets as open letters: the full title of the project was Fors Clavigera: Letters to the Workmen and Labourers of Great Britain. After decades of work as a historian and critic of art and architecture, Ruskin had come to believe that (a) the arts of his own age were, generally speaking, far less excellent than they should be; (b) that those deficiencies were inevitable by-products of a corrupt system of political economy that promoted profit for the industrialist above all and so enforced impersonal efficiency and productivity over the flourishing of makers and craftsmen; and (c) that, therefore, a critique of political economy had to be articulated before anything else. The political economy of Britain had to be fixed so that the conditions of labor could be fixed so that the arts could be renewed so that persons could thrive once more. Thus Ruskin’s first major exercise in this endeavor was a series of 1857 lectures called The Political Economy of Art. I will put up with this state of things, passively, not an hour longer. I am not an unselfish person, nor an Evangelical one; I have no particular pleasure in doing good; neither do I dislike doing it so much as to expect to be rewarded for it in another world. But I simply cannot paint, nor read, nor look at minerals, nor do anything else that I like, and the very light of the morning sky, when there is any – which is seldom, now-a-days, near London – has become hateful to me, because of the misery that I know of, and see signs of, where I know it not, which no imagination can interpret too bitterly. I must clear myself from all sense of responsibility for the material distress around me, by explaining to you, once for all, in the shortest English I can, what I know of its causes; by pointing out to you some of the methods by which it might be relieved; and by setting aside regularly some small percentage of my income, to assist, as one of yourselves, in what one and all we shall have to do; each of us laying by something, according to our means, for the common service; and having amongst us, at last, be it ever so small, a national Store instead of a National Debt. Store which, once securely founded, will fast increase, provided only you take the pains to understand, and have perseverance to maintain, the elementary principles of Human Economy, which have, of late, not only been lost sight of, but wilfully and formally entombed under pyramids of falsehood. In order to have a secure place for his financial contribution, Ruskin started a charitable organization called St. George’s Company, later (and still) the Guild of St. George; and for the teaching and explaining part of his program, he began publishing these letters. In old times, under the pure baronial power, things used, as I told you, to be differently managed by us. We were, all of us, in some sense barons; and paid ourselves for fighting. We had no pocket pistols, nor Woolwich Infants – nothing but bows and spears, good horses, (I hear after two-thirds of our existing barons have ruined their youth in horse-racing, and a good many of them their fortunes also, we are now in irremediable want of horses for our cavalry), and bright armour. Its brightness, observe, was an essential matter with us. Last autumn I saw, even in modern England, something bright; low sunshine at six o’clock of an October morning, glancing down a long bank of fern covered with hoar frost, in Yewdale, at the head of Coniston Water. I noted it as more beautiful than anything I had ever seen, to my remembrance, in gladness and infinitude of light. Now, Scott uses this very image to describe the look of the chain-mail of a soldier in one of these free companies; – Le Balafre, Quentin Durward’s uncle: – “The archer’s gorget, arm-pieces, and gauntlets were of the finest steel, curiously inlaid with silver, and his hauberk, or shirt of mail, was as clear and bright as the frost-work of a winter morning upon fern or briar.” And Sir John Hawkwood’s men, of whose proceedings in Italy I have now to give you some account, were named throughout Italy, as I told you in my first letter, the White Company of English, ‘Societas alba Anglicorum,’ or generally, the Great White Company, merely from the splendour of their arms. They crossed the Alps in 1361, and immediately caused a curious change in the Italian language. (The Woolwich Infant was a mighty cannon of which the celebrants of British power were perhaps inordinately proud.) Notice how Ruskin swerves from history to the observation of nature to his memories of his literary reading and then back to history. This kind of free association of ideas is very characteristic of Fors – as it is of many blogs. So that’s the first way in which Fors may be said to be a proto-blog. But another way is more important: Ruskin received many letters in response to each issue of Fors, and, because of his stature in English society, received a good deal of commentary in newspapers and other periodicals as well. Ruskin simply incorporated these responses, and his reflections on them, into later issues of Fors. So gradually the series became less of a monologue and more of a rich, complex, polyphonic conversation. Fors was a marvel in its own time, as important a literary/cultural/political project as any produced in the second half of the nineteenth century, but it is little known today. To some degree that is because of its intrinsic topicality, its sensitive responsiveness to the issues of its own day; but I think a more important reason for its neglect is is its combination of massiveness (hundreds and hundreds of thousands of words) and unexcerptability – you just can’t get the feel of it without reading each letter in full. Here are two early ones to give you a taste, though they are not as dialogical as the later ones would become: Letter 7 and Letter 10. But why am I so interested in this project of Ruskin’s? I’ll explain that in my next post. It’s fairly common for the local businesses I follow on Instagram to post there news of sales, or unusual opening hours, or special events. Thanks to Instagram’s refusal to enable a simple chronological feed, its insistence on inscrutable algorithmic presentations, I almost never see these until it’s too late. Sometimes I have shown up at a local food truck only to find it closed — something I would have known about in advance if my Instagram feed were chronological. Similarly, when I was in London last week, I discovered that some dear friends of mine were also there — but only the day before we were returning to the States, when it was impossible to find time to meet. If their photos had showed up in my feed when they were posted, I would’ve known in plenty of time for us to get together. Twitter is similarly brain-dead in its preferred user experience, but it has had the advantage of a vibrant network of third-party clients who bring the appearance of Twitter closer to what it ought to be. That’s about to end. Thanks, Twitter! the central focus of any genuine ritual is not the human being or even the community but rather the personage, god, or power that the ritual seeks to propitiate, plead with, or worship. For three years, starting in 1905, some of France’s most famous scientists had assembled in apartments and laboratories in Paris to study this particular Italian spirit medium — Eusapia Palladino. In addition to the Curies, others often in attendance were the celebrated physiologist Jacques-Arsène d’Arsonval, the eminent psychiatrist Gilbert Ballet, the aristocratic doctor Count Arnaud de Gramont, and three future Nobel Prize winners — the physicist Jean Baptiste Perrin, the physiologist Charles Richet, and the philosopher Henri Bergson. The French were not the only ones interested in Eusapia; from 1872 until her death in 1918, her powers were tested by teams of researchers in England, Italy, Poland, Germany, Russia, and the United States. The paranormal researchers who investigated Eusapia were not marginal eccentrics, but the cutting edge of the period’s academic establishment. Yet these researchers were exploring areas that were often marked out by their contemporaries as occult, if not downright magical. They did so not as a legacy of medieval “superstitions,” nor generally as a way to overturn science, but rather as a means to extend its borders…. I challenge one conventional notion of modernity and suggest that we should be less surprised than we usually are to find scientists of all stripes keeping company with magicians; that reason does not eliminate “superstition” but piggybacks upon it; that mechanism often produces vitalism; and that often, in a single room, we can find both séance and science. The single most familiar story in the history of science is the tale of disenchantment — of magic’s exit from the henceforth law-governed world. I am here to tell you that as broad cultural history, this narrative is wrong. Now, JJS knows far more about all this than I do, so you should my quibbles with several large grains of salt, but the story of the Curies looks different to me than it does to JJS. It seems to me that the Curies — and many like them — seek to bring the manifestations of spiritualism within the disenchanted order, under the disciplinary control of what Bruno Latour calls the “modern constitution.” Thus Pierre Curie’s emphasis on observing Eusapia under “perfectly controlled conditions”: all supposedly paranormal phenomena must justify themselves at the bar of the scientific method, and if they do, then they are no longer paranormal — they’re just normal. And in that way we do see what JJS calls “extending the borders” of science, but not in a way that restores enchantment. Rather, the modern constitution, the methodological guarantee of disenchantment, remains in place. PSA: I’ll be traveling for the next week, so there probably won’t be any posts. When did things get so bad on Twitter? It’s hard to say, even as nostalgia for the network’s simpler, friendlier days permeates the site. Was it the runup to the 2016 election? The inevitable growth beyond the insidery club of Twitter’s earliest days? The mainstreaming of meme and troll culture? In reality, the shift in discourse from freewheeling internet lab to Room Where Everyone Screams At Everyone owes itself to many things: from the things above to the worldwide SAD plague and rickets hastened by a planet of laptop dens. But quote tweets—a nice, little feature on a nice, little site meant for us to do nice, little things—have had an outsize role in the nastiness…. The result is that the ugliest things on Twitter are frequently amplified. Unlike instances of ratio-ing, quote tweets beam the ugliness straight into followers’ feeds. The problem is especially insidious with Twitter’s true merchants of hate, who capitalize on just such a reaction: What more could an aspiring alt-right toad with 1,000 followers hope for than to be huffily fired into thousands upon thousands of additional feeds? One of the ways I’ve tried to make Twitter more manageable and less frustrating is by disabling most people’s retweets. But there’s no way, on Twitter.com or on any client I know of, to disable quote-tweets. So when people want not just to spread the bad word but comment on it, to explain why it’s bad or to mock the person who originally tweeted it — and this is far more common that simply retweeting objectionable material — there’s no way for me to avoid that. Click a link in a web browser, it should open a web page, not try to open an app which you may not have installed. This is what Apple does with podcasts and now news.# Facebook is taking the place of blogs, but doesn't permit linking, styles. Posts can't have titles or include podcasts. As a result these essential features are falling into disuse. We're returning to AOL. Linking, especially is essential. Google is forcing websites to change to support HTTPS. Sounds innocuous until you realize how many millions of historic domains won't make the switch. It's as if a library decided to burn all books written before 2000, say. The web has been used as an archival medium, it isn't up to a company to decide to change that, after the fact. Every major tech company — or at least every major tech company that deals in the online world — seems to think it needs to marginalize and deprecate the open web. I’ve been mulling over The Avengers: Infinity War for the past few days, and I am ready to offer some evaluative comments. On the plus side, Thanos is maybe the best villain the MCU has produced so far. And there was some witty banter. On the minus side: everything else. This is the only Marvel movie I’ve seen that made me wish I could get my money back. There are certain elementary rules of storytelling that no honest worker in the narrative arts would ever knowingly violate. Characters who are intelligent and thoughtful at one moment do not become moronic in the next. Characters who have certain abilities – to play the piano, say, or to emit powerful force fields from their hands – do not exhibit dramatic but unexplained alternations in those abilities from scene to scene. Characters with certain essential traits, traits which they pride themselves on – mercilessness, for instance – don’t occasionally and (again) for no reason exhibit the opposite traits. Characters who die by precisely the same (magical) means do not experience that death in dramatically different ways according to whether the writers want to squeeze out some extra pathos or not. Above all, no honest worker in the narrative arts would try to extract emotional impact from the deaths of characters whose inevitable resurrection in the next film is repeatedly gestured at with big broad winks. This sheer incoherence of the movie almost put me to sleep. By the time I left the theater I had already forgotten most of what happened, because there was no meaningful sense in which it, you know, “happened.” Every movie has inconsistencies and plot holes, and this is especially true of superhero movies, we all know that; but at this point Marvel has simply stopped trying to tell stories that make sense. You’re just expected to move along from scene to scene, making the prescribed responses in the moment in complete disregard of whatever happened three minutes ago and what might happen two minutes later. But the MCU doesn’t care; why should we? MyScript has an iPad handwriting app called Nebo – I’ve been trying it out with the Apple Pencil, and it’s quite interesting. I especially like the way it allows you to create simple charts by hand and have them converted into neat images. But if you want to backup/sync your notes to Dropbox or iCloud, you have to create a MyScript account. Now, I have many other iOS apps that connect to Dropbox and iCloud, and none of them require account creation in order to do so. So I wrote to MyScript to ask them why they require this, and they won’t answer. I got a reply, but it didn’t answer my question: someone just pasted in the policy that I am asking about. So why do you think MyScript demands account creation for backup/sync? Is it simple that they want my email address so they can spam me with ads? Or could there be some additional reason? UPDATE: Just got another reply from MyScript: “This is a choice made to promote new features to registered users and because future updates will require registration, but I cannot communicate more on this subject at the moment.” Which confirms the spam-me-with-ads assumption but also suggests that there will be pricing tiers for the app in the future. But that can be done without making people create an account. So spam it is? I just wrapped up my course on The History of Disenchantment and one of the interesting elements of the class – well, interesting to me, anyway, but I think also to most of my students – involved the ways that Jason Josephson-Storm’s The Myth of Disenchantment challenges the big narrative of Taylor’s A Secular Age. Taylor’s argument, radically condensed, is that the early modern era in the West inaugurated the construction of the Modern Moral Order: an order in which (a) spirits do not populate the world and therefore cannot be directed and need not be propitiated; (b) magic is impossible; (c) God exists but is not directly involved with the world He made, which runs along on its own power; and (d) God expects everyone to meet His moral standards. In such an environment, which is not created all at once but over a period of centuries, human beings are no longer “porous” but rather “buffered” selves who dwell within a “disciplinary society” that produces good citizens of a disenchanted order. 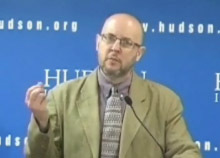 From this account – which is of course, in its large outlines, not unique to Taylor, though he adds some unique elements – Josephson-Storm (hereafter JJS) dissents. The single most familiar story in the history of science is the tale of disenchantment — of magic’s exit from the henceforth law-governed world. I am here to tell you that as broad cultural history, this narrative is wrong. Attempts to suppress magic have historically failed more often than they’ve succeeded. It is unclear to me that science necessarily deanimates nature. In fact, I will argue à la Bruno Latour that we have never been disenchanted. JJS believes, rather, that secularization, far from extinguishing enchantment, promotes and encourages and in a sense creates it. Even when the Christian God is excluded from socially acceptable belief, spirits come to take His place. Thus, “In the face of things like [Marie] Curie’s scientific séances, spiritualist revivals, and the modern resurgence of magical orders like the Golden Dawn, how did we get the idea that modernity meant disenchantment in the first place?” The Myth of Disenchantment is a fascinating and illuminating book, but I’m not sure that it successfully makes its case; I think Taylor’s argument largely survives JJS’s critique. The first point I want to note in this context is that JJS makes a subtle and unacknowledged but important shift in the terms of his argument. Early in the book he cites a series of studies that show the persistence of beliefs in spirits, ghosts, and a wide range of paranormal phenomena. This lays the groundwork for his claim that “we have never been disenchanted.” But then the rest of the book focuses exclusively on intellectuals: philosophers, physicists, historians, social scientists, plus the odd quasi-intellectual like Madame Blavatsky and Aleister Crowley. One consequence of this shift of attention is that it allows JJS to ignore enchantments or re-enchantments that had no popularity among intellectuals: thus the Order of the Golden Dawn gets discussed but not Pentecostalism, which is by any sociological measure infinitely more important and influential than the Golden Dawn. More generally, the whole vast history of Christian (and for that matter Jewish) renewal movements over the past four hundred years plays no role here. It seems to me that JJS ought at least to tip his hat to them. That said, such movements need play no major role in his story, because that story is not about Everyone, but rather primarily about those figures — from Bacon and Descartes to Madame Curie and Theodor Adorno — who are thought to be representatives of a disenchanted cosmos, or who thought themselves to be, or both. That is, the story JJS tells is of enchantment and re-enchantment appearing where they are least expected. And he tells it well. But even so, not wholly convincingly. I do not have time or leisure to develop this argument at the length it deserves, but it seems to me that what we see in episodes like Madame Curie’s interest in séances, or Max Müller’s endorsement of mysticism, or James Frazer’s speculations about some realm of knowledge that lies beyond science as we now know it, is not the persistence of an enchanted cosmos or the renewal of one. Rather, I think what we see is a group of people dwelling day-by-day and hour-by-hour fully within Taylor’s MMO who occasionally peer over the fence at goings-on among the naive, credulous, and superstitious. Up to the age of thirty, or beyond it, poetry of many kinds, such as the works of Milton, Gray, Byron, Wordsworth, Coleridge, and Shelley, gave me great pleasure, and even as a schoolboy I took intense delight in Shakespeare, especially in the historical plays. I have also said that formerly pictures gave me considerable, and music very great delight. But now for many years I cannot endure to read a line of poetry: I have tried lately to read Shakespeare, and found it so intolerably dull that it nauseated me. I have also almost lost my taste for pictures or music. Music generally sets me thinking too energetically on what I have been at work on, instead of giving me pleasure. I retain some taste for fine scenery, but it does not cause me the exquisite delight which it formerly did. On the other hand, novels which are works of the imagination, though not of a very high order, have been for years a wonderful relief and pleasure to me, and I often bless all novelists. A surprising number have been read aloud to me, and I like all if moderately good, and if they do not end unhappily—against which a law ought to be passed. A novel, according to my taste, does not come into the first class unless it contains some person whom one can thoroughly love, and if a pretty woman all the better. One might also cite the great affection of so many hard-core materialists for fantasy and superhero stories. In contrast to JJS, I would contend that this kind of thing does not mean that “we have never been disenchanted,” but that we have, and sometimes we hate it. Remember the first episode of Sherlock? Came out eight – yes, eight – years ago, and one of the most-discussed elements of the first episode was its use of texting. Sherlock texted and received texts all the time, and the content of those texts was regularly displayed our TV screens. For a thoughtful take on how the series did this, see this video essay on “Visual Writing in Sherlock” – visual writing that is by no means confined to the display of texting. I believe there's general agreement that the makers of the series not only got this right but also used it to great dramatic, and sometimes comic, effect. I don't want to take Robin's point too far, but I'm taken by the suggestion that a particular technology only becomes available for artistic representation when artists and audience are not “lost inside of it.” In this context it might be worth noting that Sherlock's representation of texting happened right after the first widespread availability of smartphones, and therefore right after people began regularly interacting with the phones in non-textual ways (especially through photos and video). Sherlock's representation of visual writing is, then, what BlackBerry use looks like when you have an iPhone. You know what else appeared in 2010? The Social Network – a movie about Facebook that showed up just when people were dismissing Facebook as uncool and turning instead to Twitter – and then to Instagram (which was also released in 2010, though it didn't become huge right away). One more artifact from that same year: Gary Shteyngart's novel Super Sad True Love Story, much of which is told through emails. So: what technologies are going to dominate the books and movies and TV shows of 2020? This lovely remembrance by Sylvia Poggioli of her father, the literary scholar Renato Poggioli, features a letter to her father from W. H. Auden, and the handwritten poem he submitted for publication in the journal Professor Poggioli edited, Inventario. Sylvia Poggioli speaks of her discovery as “a true literary find,” but the letter might be better described as a biographical find, since the poem itself has not been unknown: it’s duly recorded in Bloomfield and Mendelson’s W. H. Auden: A Bibliography, 1924-1969 (1972). Also, it’s not quite right to say, as Poggioli does, that "Auden later included these verses in a much longer piece, perhaps one of the most powerful poems of the mid-twentieth century, The Age of Anxiety”: he had already written the stanzas as part of The Age of Anxiety and was simply excerpting them for Poggioli’s journal, something he did with several other chunks of that longest of his poems. Auden truthfully told Renato Poggioli that it was an “unpublished poem,” but it would be published, along with the rest of The Age of Anxiety, just a few months later. 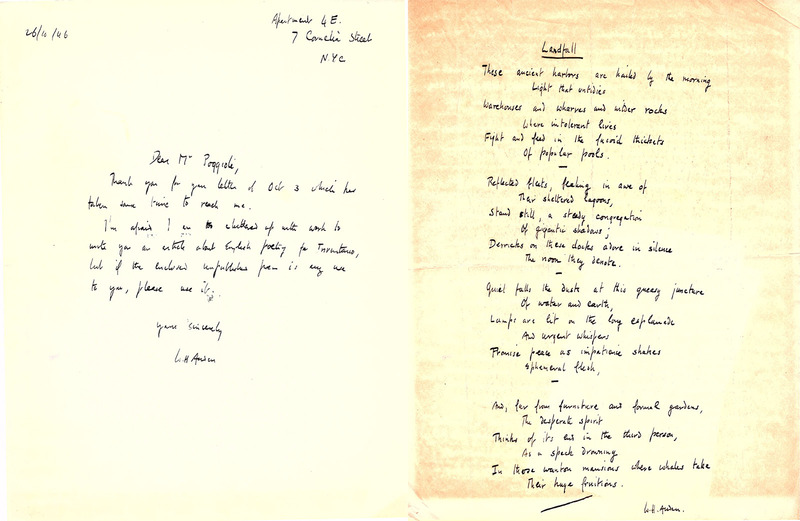 The thought that first comes to my mind when looking at the above image is the devout wish that Auden had always taken so much care to make his handwriting legible. Alas for my eyes, which have spent so many hours poring over his notebooks, he did not. Indeed, [Andrew] Piper too describes the endeavor as a “leap of faith,” since no one knew how the final work would be received by tenure and promotion committees or by UK Research Excellence Framework evaluators. One Multigraph Collective member, says Piper, was told that since there were 22 collaborators, the member’s work on Interacting with Print would count as 1/22 of a book—by word count, not even the equivalent of a journal article. In the thick of it all, however, the process was thrilling. Hierarchies of academic rank and disciplinary territoriality dissolved in a shared commitment to the work. “This project fundamentally changed my ideas about what humanities scholarship could look like and what it could achieve,” says Porter. The whole situation is a reminder of the absurdity of the current tenure system, with its crude quantitative pseudo-metrics for assessing “productivity” — but also of the power of tenure. Those of us who have it need to be engaged in projects like Interacting with Print — projects that reconfigure and extend the character of humanistic scholarship (sometimes by renewing older scholarly modes). I’m displeased with myself for not doing more along these lines. I just came across this fascinating 2015 talk by Mike Caulfield and want to call attention to a couple of elements of it. Things in the Garden don’t collapse to a single set of relations or canonical sequence, and that’s part of what we mean when we say “the web as topology” or the “web as space”. Every walk through the garden creates new paths, new meanings, and when we add things to the garden we add them in a way that allows many future, unpredicted relationships…. But in reality it doesn’t predict the web at all. Not at all. The web works very little like this. It’s weird, because in our minds the web still works like this, but it’s a fiction. “A tool to think with, not a tool to publish with” — this seems to me essential. I feel that I spend a lot of time trying to think with tools meant for publishing. From a national perspective, the number of people earning communications degrees (which was negligible in the heyday of English majors 50-60 years ago), surpassed the number getting English degrees around 20 years ago. Since then Communications has held a fairly steady share of graduates as the college population grew, while English has lost its share and in recent years even shrank in total number, as this NCES table records. In short, students voted with their feet and, for the most part, they aren’t interested in the curricular experience English has to offer (i.e. read books, talk about books, write essays about books). Peterson is very conscious of his role as just another backwater stop on the railroad line of Western Culture. His favorite citations are Jung and Nietzsche, but he also likes name-dropping Dostoevsky, Plato, Solzhenitsyn, Milton, and Goethe. He interprets all of them as part of this grand project of determining how to live well, how to deal with the misery of existence and transmute it into something holy. So maybe — just maybe — it’s not "read books, talk about books, write essays about books” that’s the problem. "not to waver with the wavering hours"
I've just been teaching Horace's Epistles, and it strikes me that Horace ought to be the man of our social-media moment — the man who shows us another and better way. Harmful to anyone, whether he’s young or old. What brings tranquility? What makes you care less? Honor? Or money? Or living your life unnoticed? Our local hill town, what do you think I pray for? Or even less, as long as I’m self-sufficient. The “wavering hours” waver because they’re charged with the nervous energy that comes from a too-busy life, a life of agitation and anxiety. As a youth Horace studied philosophy in Athens, and there he would have learned about the inestimable value of ataraxia — a peaceable and tranquil spirit. Because if you don’t have that, then you become a victim of your circumstances — and, especially in our time, a victim of propaganda. Reading old books is a very valuable thing, because it takes you out of the maelstrom of “current events”; and it’s especially valuable to read old books like those by Horace because they will tell you quite directly how vital it is for you to learn this lesson. Yes and no. I think what social media produce is emergent propaganda — propaganda that is not directed in any specific and conscious sense by anyone but rather emerges, arises, from vast masses of people who have been catechized within and by the same power-knowledge regime. Think also about the idea I got from an Adam Roberts novel: the hivemind singularity. Conscious, intentional propaganda is so twentieth century. The principalities and powers are far more sophisticated now. I’ll be thinking more about this. "a revisionist blizzard of alternative theories"
Social-media propaganda directed at Americans works the same way: in contrast to earlier forms of propaganda, which sought to arouse people to action by alerting them to new and previously unseen truths, this kind of propaganda is meant to be soporific: it seeks to make people indifferent to what’s true, incurious, and accepting of whatever addresses the emotions to which they are most fully enslaved. Long ago William Golding wrote a witty little essay called “Thinking as a Hobby” in which he identifies three levels of thought. Grade-three thinking, “more properly, is feeling, rather than thought”; it is ”full of unconscious prejudice, ignorance, and hypocrisy.” Grade-two thinking — which Golding came to practice as an adolescent — “is the detection of contradictions.... Grade-two thinkers do not stampede easily, though often they fall into the other fault and lag behind. Grade-two thinking is a withdrawal, with eyes and ears open.” Grade-two thinking is shouting “FAKE NEWS” and asking people whether they always believe what they’re told by the lamestream media, or pulling out your ink pad and rubber stamp and stamping BIGOT or RACIST on people who don’t line up with you 100%. I would say that such behavior is not “lagging behind” so much as digging in your heels and refusing to move — which herds of animals do far more frequently than they stampede. To the extent that propaganda is based on current news, it cannot permit time for thought or reflection. A man caught up in the news must remain on the surface of the event; be is carried along in the current, and can at no time take a respite to judge and appreciate; he can never stop to reflect. There is never any awareness — of himself, of his condition, of his society — for the man who lives by current events. Such a man never stops to investigate any one point, any more than he will tie together a series of news events. We already have mentioned man's inability to consider several facts or events simultaneously and to make a synthesis of them in order to face or to oppose them. One thought drives away another; old facts are chased by new ones. Under these conditions there can be no thought. And, in fact, modern man does not think about current problems; he feels them. He reacts, but be does not understand them any more than he takes responsibility for them. He is even less capable of spotting any inconsistency between successive facts; man's capacity to forget is unlimited. This is one of the most important and useful points for the propagandist, who can always be sure that a particular propaganda theme, statement, or event will be forgotten within a few weeks. Moreover, there is a spontaneous defensive reaction in the individual against an excess of information and — to the extent that he clings (unconsciously) to the unity of his own person — against inconsistencies. The best defense here is to forget the preceding event. In so doing, man denies his own continuity; to the same extent that he lives on the surface of events and makes today's events his life by obliterating yesterday's news, he refuses to see the contradictions in his own life and condemns himself to a life of successive moments, discontinuous and fragmented. Maybe I should blog a read-through of Propaganda. 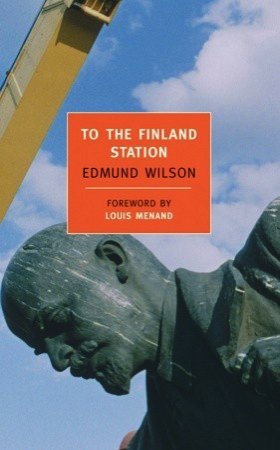 I have just re-read, for the first time in decades, Edmund Wilson’s To the Finland Station — which, it appears, NYRB Classics has allowed to go out of print, which is nearly a tragedy. It is a truly remarkable book — it is difficult to imagine anyone of our own time (least of all a journalist) handling ideas with such assurance and such verve, seeing in them the kind of drama that we typically associate with action heroes. The structure, the pacing, the style — all are superb. Perhaps the best thing about the book is how it centers itself on Karl Marx himself, bookended by predecessors (Proudhon, Robert Owen) and successors (Lenin, Trotsky). As a portrait of Marx it has not, to my knowledge, been equalled. Wilson's Freudianism, though essentially wrong, is actually quite helpful to him in understanding the Marxists, because, as he rightly points out, the great deficiency of most Marxist analyses of society is their oversimplified picture of human motivation. There’s even a passage where Wilson seems to be anticipating the rise of modern behavioral psychology and especially the role it plays in understanding of economic behavior. ”Prices are the results of situations much more complex than any of these formulas, and complicated by psychological factors which economists seldom take into account.… Let us note the crudity of the psychological motivation which underlies the worldview of Marx. It is the shortcoming of economists in general that each one understands as a rule only one or two human motivations; psychology and economics have never yet got together in such a way as really to supplement one another” (294, 295). That is an extraordinarily rich and provocative reflection. Yep. I see it every day. I think I first came across the music of Austin Cairns (AKA r beny) on Soundcloud, where he has a page you should check out, but he also posts some things just to YouTube, of which the piece above is a superb example. It has a quality that I especially prize in ambient music, which is that it rewards just as little or as much attention as you choose to give it. You can play this in the background as you work, but if you choose to focus on it there’s enough going on to fully occupy your musical neurons. (This cannot be said of much ambient music.) And there’s something oddly fascinating about watching his hands show up from time to time to make their delicate adjustments to the machine — it almost seems a living thing. And of course I really really want a Digitone now.